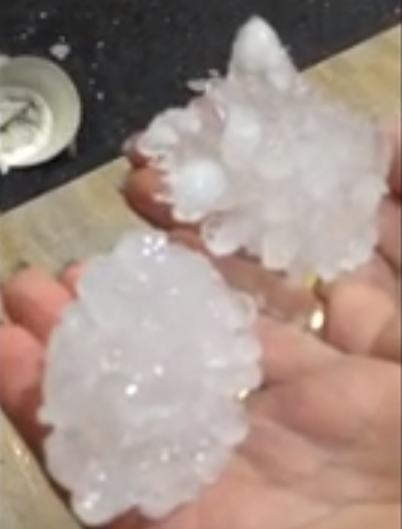 Brisbane experienced a very violent supercell storm yesterday afternoon with extreme damaging winds, very heavy rainfall rates and giant hail to the size of grape fruit. 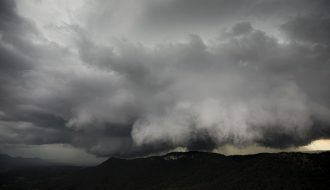 The storm developed as a southeast change moved through Gold Coast Hinterland and warm moist air and cooling air aloft overrode the this warm layer. 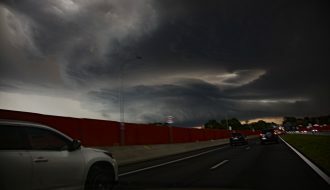 A few thunderstorms developed but one in particular exploded with huge powerful updrafts and raced in a straight path to the city of Brisbane CBD. 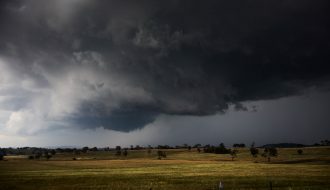 the first of the violent winds hit Archerfield with wind gusts to least 140km/h and then the well developed supercell powered on towards the city of Brisbane. 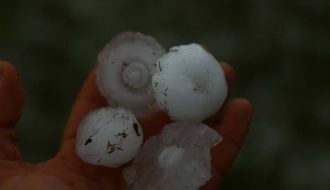 Thousands of cars were damaged by large to giant hailstones and homes were unroofed and trees toppled onto them. 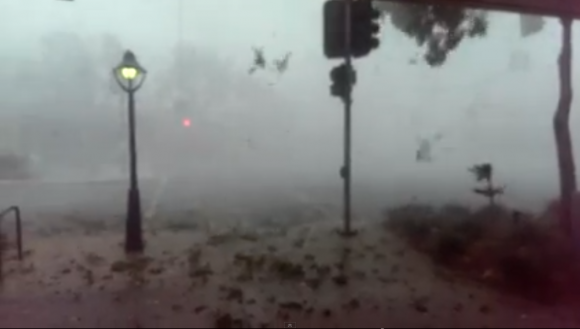 The storm was described to be "the worst in a decade". – Heaviest rain fall – 5.6 mm from 4.29 pm to 4.30 pm (That is approaching 1 mm per 10 seconds). – Highest wind gust – 141 km/h at 4.29 pm to 4.30 pm. – Average wind gust of 113 km/h at at 4.29 pm. The wind direction is from the south then south west following a wind change right on 4 pm. The maximum temperature for the day reached 32C at 1 pm but had dropped to 29.3C at 4 pm. 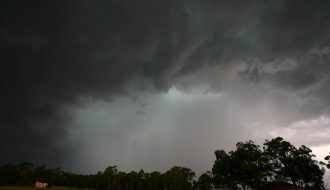 The storm hit after 4.22 pm and the temperature had dropped to 15.8C at 4.30 pm. At 4.27 pm a wind gust of 120 km/h is recorded. 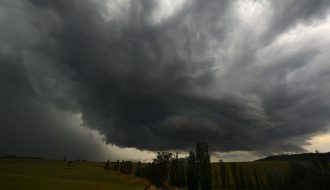 4.36 pm – A wind gust of 57 km/h is recorded (The worst of the wind is over but 21.8 mm of rain falls from 4.35 pm to 4.42 pm being approximately 3.6 mm per minute). The storm is mostly over by 5 pm excluding light rain that is easing. This shows rainfall intensities as high as 5.6 mm for 1 minute and 13 mm in 3 minutes from 4.30 pm to 4.33 pm (Slightly more than 4 mm per minute). The peak of the storm is clearly at 4.29 pm and 4.30 pm with very intense rain and wind to 4.35 pm. 4 pm – 18.7C with a temperature of 29.3C (The change in wind direction commences). 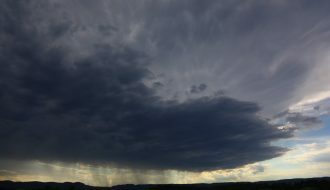 4.22pm – 16C with a temperature of 19.5C (The storm is about to hit). 4.25pm – 16.6C with a temperature of 18.1C (Gale force winds). 4.27 pm – 17.8C with a temperature of 18.5C (The storm has truly hit). 4.29 pm – 16.7C with a temperature of 17.3C (The peak of the storm). 4.30 pm – 14.8C with a temperature of 15.8C (The peak of the storm). 4.33 pm – 15.7C with a temperature of 16.2C (Worst of the wind is over but very heavy rain). 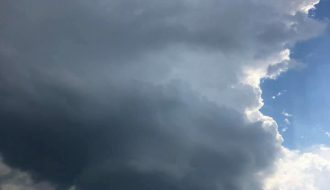 4.35 pm – 15.8C with a temperature of 16.1C (Heavy rain). 4.36 pm – 16.5C with a temperature of 16.8C (Heavy rain). 4.42 pm – 19.7C with a temperature of 20C (The heavy rain begins to ease). 5 pm – 19.5C with a temperature of 19.8C (Storm easing and light rain). 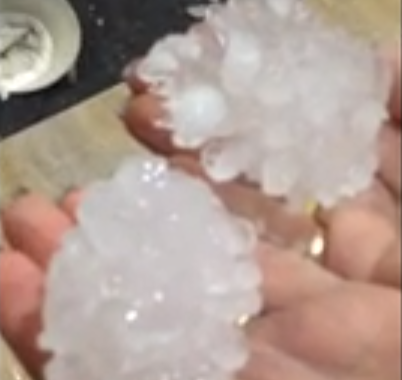 Note:- I do not know if hail was falling here as I cannot verify that. It is interesting to note that at 4.29 pm and 4.30 pm, the APP Temperature fell to minus 1.9C and minus 3.4C before rising back to 6.5C at 4.35 pm and rising back to 20.1C at 5 pm. The APP Temperature at 4 pm was 27.9C. Please keep in mind this station as far as I am aware recorded the highest wind gust and heaviest rainfall from the event. I hope this assists in piecing together how this event played out across Brisbane. Thanks for the statistics Harley Pearman – some intense falls there. Radar has been added once again as it was not working. Radar shows a quick transition to outflow dominant on Brisbane and also intense hail dump!